Chet Madison-Board Member, Felicia Bessent-Principal of Harris MS, Yuri Penermon-Principal of Rutter MS, Bill Del Bonta-Principal of Harriet Eddy MS, Richard Wal- Principalof Smedburg MS, Mike Anderson-Prinicpal of Jackman MS, and Tina Penna-Associate Superintendent. Director Shelley Davis and Project Manager Crystal Robinson. 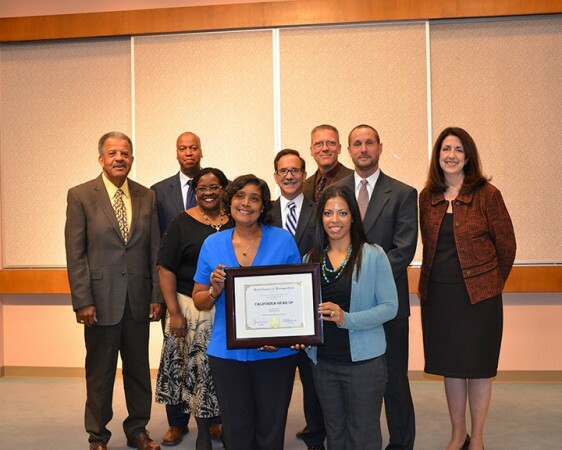 We continue to be honored to work with EGUSD in this amazing partnership that has endured since 1999. California GEAR UP looks forward to more success in creating a college-going culture throughout Elk Grove and the entire state of California. With partners like this we have no doubt we will succeed.